The Torah portion of Masei informs us of G-d’s directive that 48 cities be given to the Levites as dwellings places. Among these cities were three Cities of Refuge located on the other side of the Jordan River. This being so, why did G-d command that the Levites be given the three Cities of Refuge on the other side of the Jordan? And while it’s true that it was vital that Cities of Refuge be established on both sides of the Jordan, (See Sifri, Bamidbar 35:14; Makkos 9b.) this in itself is not sufficient reason to make these “extra-territorial” cities permanent dwelling places for the Levites. Yes, we could point out that the verse states: (Bamidbar 35:2.) “Command the Children of Israel that they give the Levites residential cities from their hereditary holdings.” Thus, these cities were not given as an inheritance from G-d, but because of an obligation placed upon the Jewish people to give a portion of their inheritance to the priestly tribe. But this answer is not entirely satisfactory. Knowing as they did that the main dwelling place of the Jewish people was in Eretz Yisrael proper, why should any Levites want to live on the other side of the Jordan? In the…Torah portion of Matos, we find that Moshe gave half the tribe of Menashe a portion on the other side of the Jordan. (Bamidbar 32:33.) Our Sages point out (Yerushalmi, Bikkurim.) that they did not ask for this land; Moshe presented it to them on his own. What I’m about to say isn’t going to be terribly popular with some people. Israel is never a very popular topic with some folks, especially those who hold to a particular social and political viewpoint. Of course, basing any opinion of current events upon what is written in the Bible is never acceptable to more “rational” human beings who believe that public opinion always trumps the will of (from their point of view) a non-existent God. But these events occurred in ancient times, so what possible impact could they have on the boundaries and borders of the modern state of Israel in the 21st century, especially if you believe the “original” boundaries were fictional or at best, part of an act fo conquest committed by the Israelites of old? He did so because the first entry of the Jewish people into Israel is connected to their final entry through Moshiach, and Moshe is considered “both the first and the final redeemer.” (See Shmos Rabbah 2:6; Devarim Rabbah conclusion of ch. 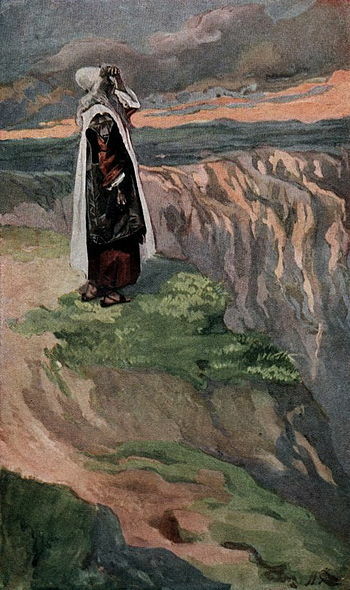 9; Zohar, Vol. I, p. 253a; Torah Or, Mishpatim, p. 75b.) This being so, his giving this portion to Menashe served to foreshadow the future redemption, at which time the boundaries of Eretz Yisrael will be broadened to include the other side of the Jordan as well. We thus see that taking a portion on the other side of the Jordan can be an entirely positive act, since it hinted at the borders of Eretz Yisrael in times to come. OK, this is midrash and mysticism thrown in with what we read in the Torah, but if it’s true; if all this occurs upon the Messiah’s return, then Israel, a very “problem nation” for much of the world, will be a great deal larger in Messianic days then it is right now (and most of the world would prefer it if Israel were a good deal smaller, even to the point of non-existence and extinction). If you don’t believe in God, the Messiah, religious Judaism, and (arguably) Christianity, you have nothing to worry about. All this is just smoke and mirrors. Even many religious and secular Jews today argue about what the borders of modern Israel should be like or even if Israel should currently exist. And yet, the world seems to be fighting extra hard against Israel, more than it fights against any other nation. Why? The wounded victims of Wednesday’s suicide terrorist attack at a Bulgarian airport have arrived home in Israel, with 32 of the wounded victims touching down in an IAF Hercules military transport aircraft at Ben-Gurion International Airport. 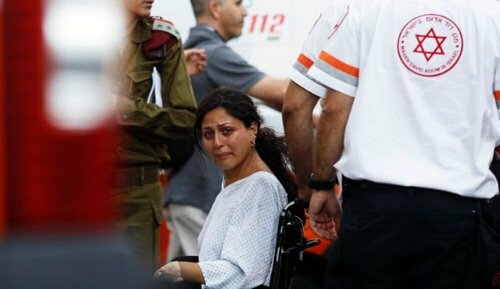 Among them was Israeli Nurit Harush, photographed by Reuters as she was pushed in a stretcher by medics after her arrival. Three others who were critically injured have remained in a hospital in Sofia, but will later be flown to Israel. First published 7/19/2012 – 1:12 p.m. The latest act of terrorism against Israel and against Jews. This is hardly an isolated incident, but because it was so public and so dramatic, the non-Israeli news agencies have been giving it a great deal of space on their webpages and on their airwaves along with Israeli news sources. One explanation for why Jews are regularly attacked, injured, and murdered, and why Israel as a nation is somehow blamed for this just because it exists in the world, is the historic enmity between the Arab and Jewish people, or between the Muslim and Jewish people. Popular public opinion cites the “fact” that Israel is an “apartheid state” (in spite of the fact that there are Arab Palestinian MKs in the Israeli Knesset) and is “occupying” lands that are “Palestinian” as the root to the actions of these oppressed “freedom fighters” as the reason for these acts of violence (and many of Israel’s critics refuse to call this “terrorism”). And don’t forget that historically, people all over the world have fought against and even murdered Jews just because they were Jews. Imagine that God is real and the national redemption of Israel in an absolute physical sense is going to occur. It’s just a matter of time. Imagine you are a Jew and you live in Israel and this is what you believe. And it’s no secret that you believe this. It’s no secret that you know God will accomplish this when Moshiach comes. If you don’t believe in God or at least, you don’t believe in the God of the Jews, that probably sounds pretty arrogant. Even if you think it’s total fantasy, you might be concerned that the Jewish nation will try to expand its borders to ultimately match what they think they should be according to God. That would eat up all of so-called “Palestine” and a significant chunk of the modern nation of Jordan (which modern Jewish Israel does not claim as far as I know). If you have enough of a social, political, national, or racial interest in all of this, you might get pretty angry. So angry that you light up the Internet with your rage. And a few folks out there might be a good deal more angry. Angry enough to blow themselves up and to take as many Jews with them as they can. Even if you believe in the prophesies in the Jewish Bible, we could still argue all day long about whether or not Israel should pursue national expansion now or wait until the coming of the Messiah. It would be a useless argument because, like so many other debates on the web, it would go exactly nowhere. A lot of people would get worked up and nothing; absolutely nothing would be accomplished. So where do we go from here? People are dying. I call it “terrorism.” I’m sure you’ll be glad to tell me what you call it. I don’t believe it’s a coincidence that this act of terror happened during what is called Bein Hametzarim, the three weeks between the fast of the Seventeenth of Tammuz and the fast of Tishah B’Av, which commemorates the occurrence of many Jewish tragedies, not the least of which are the destruction of the first and second Temples in Holy Jerusalem. Parshas Matos is always read during Bein HaMetzarim the three weeks between the fast of the Seventeenth of Tammuz and the fast of Tishah BeAv (the Ninth of Av), which are associated with the destruction of Jerusalem and the Beis HaMikdash. This recalls the negative qualities of a staff’s firmness, the severed connection to the source of vitality. On the other hand, this period is also connected with our people’s hopes of Redemption. Indeed, Tishah BeAv, the anniversary of the destruction of the Beis HaMikdash is described as “the birthday of Mashiach” a day which generates a new impetus for the coming of the Redemption. Herein lies a connection to a staff’s positive quality of firmness, because: a) in the Era of the Redemption, our people will reap the fruit of their determined resolution to carry out G-d’s will despite the challenges of Exile; and b) it is in the Era of the Redemption that G-d’s essence, the ultimate source of strength, will become manifest in our world, His dwelling. Perhaps even during this time of double mourning, there is a ray of hope. In every hardship, search for the spark of good and cling to it. The greater the hardship, the more wondrous the good it bears. 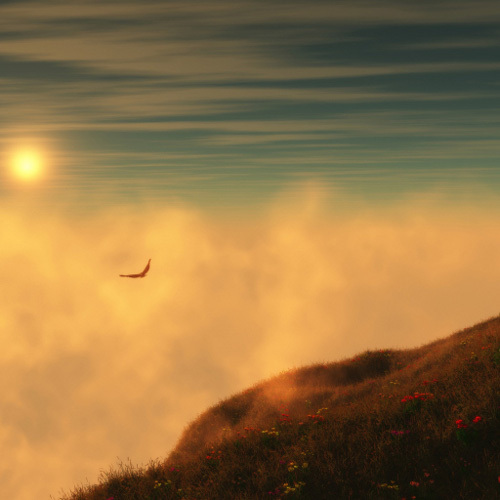 If you cannot find that spark, rejoice that wonder beyond your comprehension has befallen you. Once you have unveiled and liberated the spark of good, it will rise to overcome its guise of darkness. It may perhaps even transform the darkness fully to light. I know that there’s a lot of sadness and anger going on and redeeming “hidden sparks” is probably far from most people’s minds at the moment. All they can do is live inside the pain and sorrow and grief. It’s not yet time to start looking for the sparks, gathering them, and sending them back to their source in Heaven. But the day will come when the sparks will fly free. The day will come when he will come; Messiah, Son of David, and he will liberate his people Israel and place his nation as the head of nations. And his people will be safe. And grief will be only in the past at last…at long last.